Wow. This looks great! There's not much of a storyline revealed yet, but I'm hooked anyway. A teaser trailer (essentially a proof-of-concept video) for a French sci-fi film called Ickerman has debuted online and it's a must watch. The project has been picking up buzz at genre markets including Tallinn Black Nights and Frontieres Brussels as they're looking for additional funding to start shooting in 2017, since this teaser was made after only one day of filming in Paris. The script, co-written by the two directors, has been developed during the past year and will be polished in the coming months by a English-speaking screenwriter. I love the look of the vehicles and the world, and the VFX is impressive, it feels very natural and looks very unique. 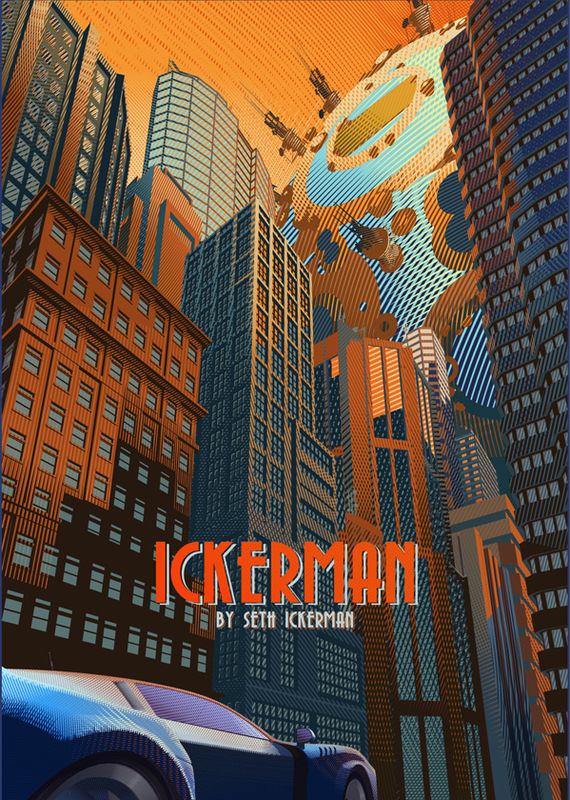 Taking place in a futuristic megalopolis where new technologies and virtual reality are ruling society, Ickerman follows the adventures of a nostalgic high-school teacher obsessed with 35 mm films and old cars. As he tries to rescue his best friend from the guru of this digital era, he falls into his imaginary world, acting like the characters he admires, and gives back to this world a part of reality… Ickerman is a sci-fi project marking the featuring directing debut of Raphaël Hernandez & Savitri Joly-Gonfard (aka Seth Ickerman), with original music by Rob (Maniac, Horns). This teaser was filmed in one-night in Paris' business district La Défense and produced in record-time (three months with only one VFX artist) with a limited budget (only 1,000 euros!). They're hoping to start filming in early 2017 once they secure funding. For more info on this sci-fi project, visit their official website here, or follow them on Facebook or Twitter. Blade Runner meets Drive??? This looks awesome! amAzing! you Know what? thIs looks like what a propeR live action version of a certAin good anime could be! People don't know what Akira is? Kindo fun. The retro car though? For some reason I want to drive a Lincoln. Cool Mustang and futuristic visual feel. But doesn't that dude know that you simply cannot stop the steamrolling march of technology? Hmm, that must be some alien invasion. And what is their problem with Earth old cars? This is pretty sweet! Love it!